Hey there Peeps! It's the first and you know what that means? 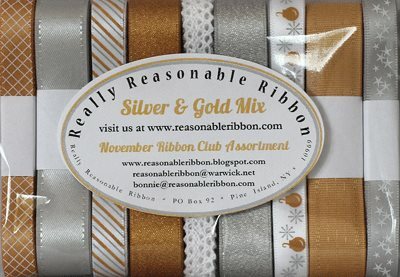 I get to show off the new November Ribbon Club Assortment!!! You are gonna love the Silver and Gold Mix. Isn't it just dreamy???? I'm having lots of fun with these scrumptious ribbons and lace so be ready to see many projects with these glam trimmings! I mixed in a little Chevron Striped Twill in Champagne and Antique Burlap String for this updated vintage card. Papers and image from Canvas Corp Brands. I dressed it up a bit with Magnolia Flowers and Sweetheart Blossoms, painted jingle bells, metal eyelets and a tiny skate. I love this so much!!! This is the prettiest Christmas project I've seen this year! Adore it! Love the beautiful bells with this gorgeous bow. The vintage card is so beautiful and love that sled. Gorgeous Christmas card.